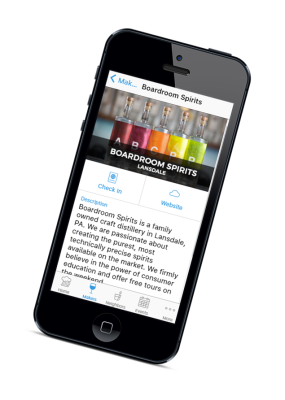 Download the Montco Makers app to discover all of the great breweries, wineries, and distilleries of Montgomery County, Pa. Best of all, you can earn rewards for stopping by your favorite place or trying something new. Use the Makers tab to find a maker near you. Visit your Maker of choice. Every Check-in gets you closer to earning some cool Montco Makers swag! You must be 21 or older to use our app. Sorry, kids. Check-ins are based on geolocation - you must be at the location in order to Check-in. You can only Check-in at a location once. While repeat visits to your favorite places are encouraged, your "level" is based on the number of locations you Check-in at.